Lightly spray candy molds or miniature muffin cups with cooking spray. In large bowl, sprinkle gelatin on 1/2 cup cold water; set aside. In small saucepan, heat 3/4 cup water and 2 cups sugar to boiling over high heat. Reduce heat; simmer uncovered 5 minutes until sugar is dissolved and mixture thickens slightly. Remove from heat; carefully add to gelatin mixture, stirring until gelatin is dissolved. Divide mixture into 4 small bowls (or more, depending on how many colors/flavors you want). Tint each bowl with 4 to 5 drops food color, then stir in 1/2 teaspoon extract. Carefully spoon mixture into molds. Refrigerate 8 hours or overnight until set. Carefully remove gumdrops from molds, using a butter knife as needed to coax gumdrops from molds. 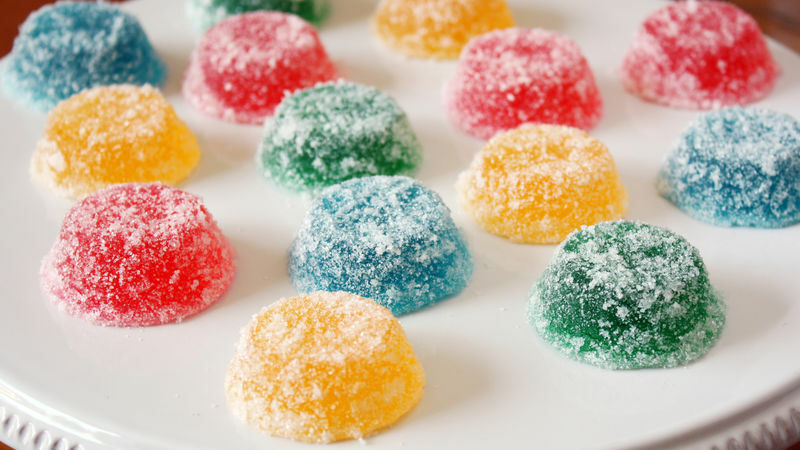 Roll gumdrops in sugar; place on waxed paper. Let stand at room temperature 24 hours to crystallize slightly. Store tightly covered at room temperature. Combine flavored extracts for unique flavors, like vanilla-orange and lemon-lime. Don’t have candy molds or a mini muffin tin? Use mini loaf pans and cut the gelatin into squares to remove.